Ballspielverein Borussia 09 e.V. Dortmund, commonly known as Borussia Dortmund [boˈʁʊsi̯aː ˈdɔʁtmʊnt], BVB, or simply Dortmund, is a German sports club based in Dortmund, North Rhine-Westphalia. Founded in 1909 by eighteen football players from Dortmund, the football team is part of a large membership-based sports club with more than 145,000 members, making BVB the second largest sports club by membership in Germany. Dortmund plays in the Bundesliga, the top tier of the German football league system. Borussia Dortmund have won eight German championships, four DFB-Pokals, five DFL-Supercups, one UEFA Champions League, one UEFA Cup Winners' Cup, and one Intercontinental Cup. Their Cup Winners' Cup win in 1966 made them the first German club to win a European title. Since 1974, Dortmund have played their home games at Westfalenstadion, named after its home region of Westphalia. The stadium is the largest in Germany and Dortmund has the highest average attendance of any association football club in the world. Borussia Dortmund's colours are black and yellow, giving the club its nickname die Schwarzgelben. Dortmund holds a long-standing rivalry with Ruhr neighbours Schalke 04, known as the Revierderby. In terms of Deloitte's annual Football Money League, Dortmund is the second richest sports club in Germany and the 11th richest football team in the world. 1.5 21st century and Borussia "goes public"
The 1930s saw the rise of the Third Reich, which restructured sports and football organisations throughout the nation to suit the regime's goals. Borussia's president was replaced when he refused to join the Nazi Party, and a couple of members who surreptitiously used the club's offices to produce anti-Nazi pamphlets were executed in the last days of the war. The club did have greater success in the newly established Gauliga Westfalen, but would have to wait until after World War II to make a breakthrough. It was during this time that Borussia developed its intense rivalry with Schalke 04 of suburban Gelsenkirchen, the most successful side of the era (see Revierderby). Like every other organisation in Germany, Borussia was dissolved by the Allied occupation authorities after the war in an attempt to distance the country's institutions from its so-recent Nazi past. There was a short-lived attempt to merge the club with two others – Werksportgemeinschaft Hoesch and Freier Sportverein 98 – as Sportgemeinschaft Borussia von 1898, but it was as Ballspiel-Verein Borussia (BVB) that they made their first appearance in the national league final in 1949, where they lost 2–3 to VfR Mannheim. In 1962, the DFB met in Dortmund and voted to establish a professional football league in Germany, to begin play in August 1963 as the Bundesliga. Borussia Dortmund earned its place among the first sixteen clubs to play in the league by winning the last pre-Bundesliga national championship. Runners-up 1. FC Köln also earned an automatic berth. 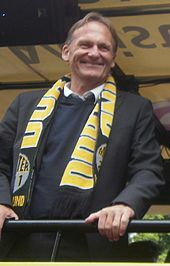 Dortmund's Friedhelm Konietzka scored the first-ever Bundesliga goal a minute into the match, which they would eventually lose 2–3 to Werder Bremen. Dortmund continued to have financial problems through the 1980s. BVB avoided being relegated in 1986 by winning a third decisive playoff game against Fortuna Köln after finishing the regular season in 16th place. Dortmund did not enjoy any significant success again until a 4–1 DFB-Pokal win in 1989 against Werder Bremen. It was Horst Köppel's first trophy as a manager. Dortmund then won the 1989 DFL-Supercup 4–3 against rivals Bayern Munich. In 1996–97 the team reached its first European Cup final. In a memorable 1997 UEFA Champions League Final at the Olympiastadion in Munich, Dortmund faced the holders Juventus. Karl-Heinz Riedle put Dortmund ahead, shooting under goalkeeper Angelo Peruzzi from a cross by Paul Lambert. Riedle then made it two with a bullet header from a corner kick. In the second half, Alessandro Del Piero pulled one back for Juventus with a back heel. Then 20-year-old substitute and local boy Lars Ricken latched onto a through pass by Andreas Möller. Only 16 seconds after coming on to the pitch, Ricken chipped Peruzzi in the Juventus goal from over 20 yards out with his first touch of the ball. With Zinedine Zidane unable to make an impression for Juventus against the close marking of Lambert, Dortmund lifted the trophy with a 3–1 victory. Dortmund's fortunes then steadily declined for a number of years. Poor financial management led to a heavy debt load and the sale of their Westfalenstadion grounds. The situation was compounded by failure to advance in the 2003–04 UEFA Champions League, when the team was eliminated on penalties in the qualifying rounds by Club Brugge. In 2003, Bayern Munich loaned €2 million to Dortmund for several months to pay their payroll. Borussia was again driven to the brink of bankruptcy in 2005, the original €11 value of its shares having plummeted by over 80% on the Frankfurt Stock Exchange. The response to the crisis included a 20% pay cut for all players. In 2006, in order to reduce debt, the Westfalenstadion was renamed "Signal Iduna Park" after a local insurance company. The naming rights agreement runs until 2021. Entering the 2010–11 season, Dortmund fielded a young and vibrant roster. On 4 December 2010, Borussia became Herbstmeister ("Autumn Champion"), an unofficial accolade going to the league leader at the winter break. They did this three matches before the break, sharing the record for having achieved this earliest with Eintracht Frankfurt (1993–94) and 1. FC Kaiserslautern (1997–98). On 30 April 2011, the club beat 1. FC Nürnberg 2–0 at home, while second-place Bayer Leverkusen lost, leaving Dortmund eight points clear with two games to play. This championship equalled the seven national titles held by rivals Schalke 04, and guaranteed a spot in the 2011–12 Champions League group stages. One year later, Dortmund made a successful defence of its Bundesliga title with a win over Borussia Mönchengladbach, again on the 32nd match day. By the 34th and final match day, Dortmund set a new record with the most points—81���ever gained by a club in one Bundesliga season. This was surpassed the following season by Bayern Munich's 91 points. The club's eighth championship places it third in total national titles, and players will now wear two stars over their uniform crest in recognition of the team's five Bundesliga titles. Notable names from the winning roster include Lucas Barrios, Mario Götze, Neven Subotić, Mats Hummels, Robert Lewandowski, Shinji Kagawa, Łukasz Piszczek, Jakub Błaszczykowski, Kevin Großkreutz, Ivan Perišić and İlkay Gündoğan. The club capped its successful 2011–12 season by winning the double for the first time by beating Bayern 5–2 in the final of the DFB-Pokal. Borussia Dortmund are one of four German clubs to win the Bundesliga and DFB-Pokal double, along with Bayern Munich, 1. FC Köln and Werder Bremen. The club was voted Team of the Year 2011 at the annual Sportler des Jahres (German Sports Personality of the Year) awards. In the 2015–16 season, Dortmund started off on a high, winning 4–0 against Borussia Mönchengladbach on the opening day, followed by five-straight wins which took them to the top of the Bundesliga. After the eighth matchday, they were surpassed by Bayern Munich following an unlucky draw with 1899 Hoffenheim. Dortmund kept their performances up, winning 24 out of 34 league games and becoming the best Bundesliga runner-up team of all time. In the Europa League, they advanced to the quarter-finals, getting knocked out by a Jürgen Klopp-led Liverpool in a dramatic comeback at Anfield, where defender Dejan Lovren scored a late goal to make it 4–3 to the Reds and 5–4 on aggregate. In the 2015–16 DFB-Pokal, for the third-straight year Dortmund made it to the competition final, but lost to Bayern Munich on penalties. On 11 April 2017, three explosions occurred near the team's bus on its way to a Champions League match against AS Monaco at the Signal Iduna Park. Defender Marc Bartra was injured, and taken to hospital. Dortmund went on to lose the game 2–3 to AS Monaco. Dortmund's manager, Thomas Tuchel, blamed the loss as a result of an ignorant decision by UEFA. UEFA went on to say that the team made no objection to playing, and that the decision was made in compliance with the club and local law enforcement. In the second leg, Dortmund went on to lose 1–3, leaving the aggregate score at 3–6, and seeing them eliminated from that year's UEFA Champions League. On 26 April, Dortmund defeated Bayern Munich 3–2 in Munich to advance to the 2017 DFB-Pokal Final, Dortmund's fourth consecutive final and fifth in six seasons. On 27 May, Dortmund won the 2016–17 DFB-Pokal 2–1 over Eintracht Frankfurt with the winner coming from a penalty converted by Pierre-Emerick Aubameyang. The Westfalenstadion is the home stadium of Borussia Dortmund, Germany's largest stadium and the seventh-largest in Europe. The stadium is officially named "Signal Iduna Park" after insurance company Signal Iduna purchased the rights to name the stadium until 2021. This name, however, cannot be used when hosting FIFA and UEFA events, since these governing bodies have policies forbidding corporate sponsorship from companies that are not official tournament partners. During the 2006 World Cup, the stadium was referred to as "FIFA World Cup Stadium, Dortmund", while in UEFA club matches, it is known as "BVB Stadion Dortmund". The stadium currently hosts up to 81,359 spectators (standing and seated) for league matches and 65,829 seated spectators for international matches. For these, the characteristic southern grandstand is re-equipped with seats to conform to FIFA regulations. Borussia Dortmund's training ground and Academy base Hohenbuschei is located in Brackel, a district of Dortmund. Inside the complex, there are physical exercise training for physical fitness and rehabilitation robotics areas, physiotherapy and massage rooms, and remedial and hydrotherapy pools. There are also sauna rooms, steam rooms and weight rooms, classrooms, conference halls, offices for the BVB front office, a restaurant, and a TV studio to interview the BVB professional footballers and coaching staff for BVB total!, the channel owned by the club. On the grounds, there are five grass pitches, two of which have under-soil heating, one artificial grass field, three small grass pitches and a multi-functional sports arena. The site covers a total area of 18,000 m2 (190,000 sq ft). In addition, the club owns a Footbonaut, a training robot which is effectively a 14 m2 (150 sq ft) training cage. Borussia Dortmund e.V. is represented by its management board and a board of directors consisting of president Dr. Reinhard Rauball, his proxy and vice-president Gerd Pieper, and treasurer Dr. Reinhold Lunow. Professional football at Dortmund is run by the organisation Borussia Dortmund GmbH & Co. KGaA. This corporation model has two types of participators: at least one partner with unlimited liability and at least one partner with limited liability. The investment of the latter is divided into stocks. The organisation Borussia Dortmund GmbH is the partner with unlimited liability and is responsible for the management and representation of Borussia Dortmund GmbH & Co. KGaA. Borussia Dortmund GmbH is fully owned by the sports club, Borussia Dortmund e.V. This organizational structure was designed to ensure that the sports club has full control over the professional squad. The stock of Borussia Dortmund GmbH & Co. KGaA was floated on the stock market in October 2000 and is listed in the General Standard of Deutsche Börse AG. Borussia Dortmund GmbH & Co. KGaA became the first and so far the only publicly traded sports club on the German stock market. 5.53% of Borussia Dortmund GmbH & Co. KGaA is owned by the sports club, Borussia Dortmund e.V. ; 9.33% by Bernd Geske; and 59.93% widely spread shareholdings. Hans-Joachim Watzke is the CEO and Thomas Treß is the CFO of the GmbH & Co. KGaA. Michael Zorc as sporting director is responsible for the first team, the coaching staff, the youth and junior section, and scouting. The supervisory board consists, among others, of politicians Werner Müller and Peer Steinbrück. Borussia Dortmund e.V. and Borussia Dortmund GmbH & Co. KGaA's economic indicators reveal that BVB will be generating revenue of €305 million (US$408 million) from September 2012 to August 2013. Dortmund's main advertising partner and current shirt sponsor is Evonik. The insurance company Signal Iduna purchased the rights to name the Westfalenstadion Signal Iduna Park until 2021. The main equipment supplier is Puma since the 2012–13 season. The contract is valid until 2025. The club announced a deal with Opel to be the first-ever sleeve sponsor from the 2017–18 season. Borussia Dortmund signed a partnership agreement with Warriors FC of the Singapore Premier League in May 2018. Their association involves close co-operation on training and player scouting. Borussia Dortmund signed a partnership agreement with Buriram United of the Thai League 1 in October 2018. There is the deal to work together at youth level. Since 1963, 18 players have held the position of club captain for Borussia Dortmund. The first club captain after the introduction of the Bundesliga was Alfred Schmidt, who was captain from 1963 to 1965. 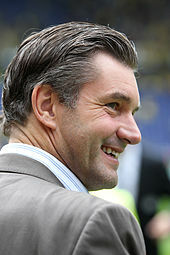 The longest-serving captain Michael Zorc, who was club captain from 1988 to 1997, has the distinction of having won the most trophies as captain; he won two Bundesliga titles, one DFB-Pokal, three DFL-Supercups and one UEFA Champions League. The current club captain is Marco Reus, who took over after Marcel Schmelzer stepped down from his role as the club's captain for the 2018–19 season. In July 1935, Fritz Thelen became the club's first full-time head coach, but was not available in the first months of the season, forcing Dortmund player and Germany international Ernst Kuzorra to take over instead. In 1966, Willi Multhaup led his side to the European Cup Winners' Cup, the first German team to win a European trophy. Horst Köppel was the coach to bring major silverware to the club for the first time in over 20 years, winning the DFB-Pokal in 1989. ^ "Borussia Dortmund's Signal Iduna Park expansion: Germany's biggest stadium set to get bigger!". Bundesliga. Retrieved 1 July 2018. 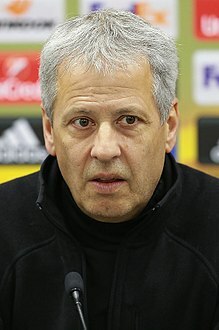 ^ a b c d "Lucien Favre to become Borussia Dortmund head coach". Borussia Dortmund. Retrieved 22 May 2018. ^ "The fourth biggest club in the world". bvb.de. 28 November 2016. Retrieved 29 November 2016. ^ a b "2011–12 World Football Attendances – Best Drawing Leagues (Chart of Top-20-drawing national leagues of association football) / Plus list of 35-highest drawing association football clubs in the world in 2011–12". ^ "Borussia Dortmund – Puma SE". puma.com. Puma SE. Archived from the original on 13 January 2014. Retrieved 17 August 2013. ^ "Borussia Dortmund – UEFA". uefa.com. UEFA. Retrieved 17 August 2013. ^ a b "Deloitte Football Money League 2015 – Commercial breaks" (PDF). deloitte.com. 2015. Archived from the original (PDF) on 22 January 2015. Retrieved 12 March 2015. ^ "A turbulent founding on 19/12/1909". BVB Club Website. Retrieved 9 August 2014. ^ "Paul Lambert – The Norwich wizard". ESPN. 4 May 2011. Archived from the original on 23 December 2011. Retrieved 28 November 2011. ^ "Norwich City manager Paul Lambert on his vision for the future". Sunday Herald. 6 September 2009. Retrieved 28 November 2011. ^ "Revealed: The Joy of Six: British and Irish footballers abroad". The Guardian. London. 25 November 2011. Retrieved 28 November 2011. ^ Leme de Arruda, Marcelo (2 August 1999). "Intercontinental Club Cup 1997". RSSSF. Retrieved 7 May 2012. ^ "Borussia Dortmund v Real Madrid – Champions League Preview". theoriginalwinger.com. 23 April 2013. Retrieved 17 August 2013. ^ "Chapuisat: Dortmund v Madrid will be 'incredible'". UEFA.com. 22 April 2013. ^ "Borussia Dortmund fans and investors aren't on the same team". Deutsche Welle. 13 May 2011. Retrieved 12 July 2018. ^ "Bayern Munich vs Borussia Dortmund: The first all-German Champions League final". indiatoday.intoday.in. India Today. 24 May 2013. Retrieved 17 August 2013. ^ Von abendblatt.de. "Pikantes Geheimnis – Hoeneß plaudert: "Haben BVB zwei Millionen Euro geliehen" – Sport – Fußball – Hamburger Abendblatt" (in German). Abendblatt.de. Retrieved 5 March 2013. ^ sid (4 December 2010). "Dortmund vorzeitig Bundesliga-Herbstmeister" (in German). Focus online. Retrieved 5 December 2010. ^ "Borussia Dortmund wrap up Bundesliga title". guardian.co.uk. Guardian Online. 30 April 2011. Retrieved 1 May 2011. ^ "81 Punkte! BVB bester Meister aller Zeiten" [81 Points! BVB is the best Champion of all Time] (in German). SportBild.de. 5 May 2012. Retrieved 12 May 2012. ^ "Dortmund, der beste Deutsche Meister aller Zeiten" [Dortmund, the best German Champion of all Time] (in German). Welt Online. 5 May 2012. Retrieved 12 May 2012. ^ "Super Bayern rewrite the history books". Bayern Munich. 18 May 2013. Retrieved 18 May 2013. ^ "Die Double-Gewinner des deutschen Fussballs" [The double-winners of German football] (in German). rp.online. Retrieved 26 April 2013. ^ "UEFA Champions League 2013 – Dortmund-Bayern Players – UEFA.com". ^ "Dortmund prevail over Bayern in Supercup thriller". Archived from the original on 6 November 2013. ^ "Borussia Dortmund Termine 14–15" [Borussia Dortmund 2014–15 Results]. Kicker.de (in German). Retrieved 24 November 2014. ^ "Final". Archived from the original on 3 March 2015. ^ "B Dortmund 4–0 B Mgladbach". Retrieved 8 August 2016. ^ "Verflixte 12! Rudy beendet Dortmunds starke Serie: TSG Hoffenheim – Borussia Dortmund 1:1 (1:0)". kicker online. Retrieved 8 August 2016. ^ "Borussia Dortmund: Der beste Zweitplatzierte aller Zeiten – Platz eins unerreichbar?". 15 February 2016. Retrieved 8 August 2016. ^ Anfield, Andy Hunter at (15 April 2016). "Liverpool's Lovren sinks Borussia Dortmund in remarkable comeback". The Guardian. ISSN 0261-3077. Retrieved 8 August 2016. ^ "DFB-Pokal: Bayern holen Pokalsieg im Elfmeterschießen". Die Zeit. 22 May 2016. ISSN 0044-2070. Retrieved 8 August 2016. ^ "Borussia Dortmund football team bus hit by explosions". BBC News. 11 April 2017. Retrieved 11 April 2017. ^ "Marc Bartra hurt in explosions near Dortmund team bus, game postponed". ESPNFC.com. 11 April 2017. Retrieved 11 April 2017. ^ "Borussia Dortmund: Thomas Tuchel says club 'ignored' over Monaco tie". BBC Sport. 12 April 2017. Retrieved 12 April 2017. ^ "Borussia Dortmund und Signal Iduna verlängern Zusammenarbeit bis 2021" (in German). aktie.bvb.de. Retrieved 23 July 2013. ^ "Dortmunds Stadionkapazität erhöht sich" (in German). Kicker. 16 July 2015. Retrieved 17 July 2015. ^ "SIGNAL IDUNA PARK, Borussia Dortmund" (in German). stadionwelt.de. Retrieved 26 July 2015. ^ Smith, Ben (15 October 2014). "Price of Football 2014: Why fans flock to Borussia Dortmund". BBC Sport. Retrieved 1 November 2014. ^ a b "BVB-Trainingszentrum in Dortmund-Brackel am Hohenbuschei eröffnet" (in German). Der Westen. Retrieved 6 April 2011. ^ "Trainingszentrum wird eingeweiht Borussia zieht nach Brackel um" (in German). Borussia Dortmund. Retrieved 10 June 2018. ^ "Startschuss ist gefallen – Trainingszentrum wird erweitert" (in German). Ruhr Nachrichten. Retrieved 18 June 2010. ^ "Footbonaut: "Der Kreativität sind keine Grenzen gesetzt"" (in German). Deutscher Fußball-Bund. Retrieved 10 June 2018. ^ "The Future of Sport: Borussia Dortmund Football Training Robot". Soccer Box. Retrieved 10 June 2018. ^ "Der Verein" [The Club]. bvb.de (in German). BVB. Retrieved 18 April 2014. ^ "Unternehmensportrait / BVB auf einen Blick / BVB Aktie" (in German). Aktie.bvb.de. Retrieved 27 August 2013. ^ a b c "Shareholder Structure". aktie.bvb.de. Retrieved 9 March 2019. ^ a b "Organisation and Management". aktie.bvb.de. Retrieved 23 July 2013. ^ a b "Supervisory Board". aktie.bvb.de. Retrieved 23 July 2013. ^ "Football: Dortmund's delight at record sales and profit". bvb.de. worldfootball.net. 23 August 2013. Retrieved 1 September 2013. ^ "Borussia Dortmund log highest profit ever". dw.de. Deutsche Welle. August 2013. Retrieved 1 September 2013. ^ "Borussia Dortmund Bilanz, Gewinn und Umsatz | Borussia Dortmund Geschäftsbericht | 549309". wallstreet-online.de. Retrieved 5 November 2018. ^ a b "Evonik verlängert bis 2025 und kauft BVB-Anteile" (in German). Sponsors. Retrieved 6 June 2014. ^ "Borussia Dortmund and stadium naming right sponsor Signal Iduna have extended their agreement until 2021". Borussia Dortmund. Retrieved 9 May 2012. ^ a b "Puma becomes technical kit supplier and sponsor of Borussia Dortmund". Borussia Dortmund. Retrieved 26 October 2011. ^ "Puma bleibt BVB-Ausrüster" (in German). Kicker. 17 November 2018. Retrieved 17 November 2018. ^ a b "Borussia Dortmund Signs Opel Sleeve Sponsor Deal". Footy Headlines. Retrieved 3 August 2017. ^ "Sponsorenvertrag vorzeitig bis 2021 verlängert! – Die Kitzbüheler Alpen bleiben weiterhin Partner von Borussia Dortmund" (in German). Kitzbüheler Alpen Marketing. Retrieved 2 July 2018. ^ "Borussia Dortmund wird Textilhersteller" (in German). Die Welt. Retrieved 15 July 2018. ^ "Borussia Dortmund schließt Sponsor- und Ausrüstervertrag mit Nike" (in German). Borussia Dortmund. Retrieved 1 August 2003. ^ "Neuer Ausrüster: Kappa kleidet BVB ein" (in German). Westfälischen Rundschau. Retrieved 26 January 2009. ^ "Borussia Dortmund: Die Eisverkäufer" (in German). Süddeutsche Zeitung. Retrieved 23 July 2013. ^ "BVB präsentiert neues Trikot – Die RAG setzt (Ausrufe-)Zeichen" (in German). Borussia Dortmund. Retrieved 23 July 2013. ^ a b "BVB announce partnership with football clubs in the US". Borussia Dortmund. Retrieved 16 November 2014. ^ "Johor DT to form partnership with Borussia Dortmund". FourthOfficial. Retrieved 18 October 2014. ^ "Dortmund's Thai partnership up and running in Suphanburi". Bundesliga. Retrieved 3 September 2016. ^ "Borussia Dortmund kooperiert mit Magath-Klub Shandong" (in German). Westdeutscher Rundfunk. Retrieved 24 August 2017. ^ "Partnership between Warriors Football Club and Borussia Dortmund". Warriors FC. Retrieved 6 May 2018. ^ "ก้าวสำคัญ! บุรีรัมย์ ยูไนเต็ด จับมือ ดอร์ทมุนด์ สู่การเป็นสโมสรฟุตบอลอาชีพระดับโลก". Butitam United. Retrieved 11 October 2018. ^ "สู่ระดับโลก! บุรีรัมย์ ผูกพันธมิตร ดอร์ทมุนด์". fourfourtwo. Retrieved 11 October 2018. ^ "Borussia Dortmund partner up with Thai Champions Buriram United". futbolita. Retrieved 25 October 2018. ^ "Club Marconi Seals Partnership With Borussia Dortmund". Goal.com. Retrieved 25 March 2019. ^ "Borussia Dortmund win charity match against 'Team Japan'". ^ "leuchte auf – Die BVB Stiftung" (in German). ^ "Borussia Dortmund support flood victims". Archived from the original on 4 January 2014. ^ "First Team". bvb.de. Retrieved 31 August 2018. ^ "Borussia Dortmund Kader" (in German). bundesliga.com. Retrieved 4 September 2018. ^ "Bürki die neue 1! So geht der BVB in die Saison 18/19" (in German). Ruhr Nachrichten. Retrieved 1 July 2018. ^ a b c d "Hummels, Zorc, wer noch? Die BVB-Kapitäne seit 1963" (in German). Kicker. Retrieved 6 June 2018. ^ "Spieler und Trainer – Wer waren die Mannschaftskapitäne des BVB?" (in German). Borussia Dortmund. Retrieved 6 June 2018. ^ a b "Schmelzer tritt als Kapitän beim BVB zurück" (in German). Spiegel Online. Retrieved 22 May 2018. ^ a b "Favre confirms Marco Reus as new BVB captain!". Borussia Dortmund. Retrieved 3 August 2018. ^ a b c d e f g h i j k l "First Team". Borussia Dortmund. Retrieved 1 July 2018. ^ "Abteilung für Sportmedizin" (in German). Klinikum Westfalen. Retrieved 1 July 2018. ^ "Das ist der BVB-Kader für die Saison 2017/18" (in German). Halterner Zeitung. Retrieved 12 August 2017. ^ "BVB holt Videoanalyst Kai-Norman Schulz von Austria Wien" (in German). Westdeutsche Allgemeine Zeitung. Retrieved 22 December 2017. ^ "BVB-Chefscout wechselt zum FC Arsenal" (in German). Spiegel Online. Retrieved 20 November 2017. ^ a b "BVB holt Klopp-Scout aus Liverpool" (in German). Sport1. Retrieved 26 June 2018. ^ "Artur Płatek, skaut Borussii w długim wywiadzie" (in Polish). Weszło. Retrieved 21 November 2013. ^ "Ex-RWE-Coach Wrobel geht für den BVB auf Talentsuche" (in German). Funke Mediengruppe. Retrieved 9 September 2014. ^ "Organisation and Management". Borussia Dortmund. Retrieved 1 July 2018. ^ "Königstransfer am Start: Kehl fängt beim BVB an" (in German). Kicker. Retrieved 1 June 2018. ^ "Der neue BVB II-Manager Ingo Preuß über seine Arbeit" (in German). Ruhr Nachrichten. Retrieved 4 May 2011. ^ "Lars Ricken Is Borussia's New Youth Coordinator". Borussia Dortmund. Retrieved 1 July 2018. ^ "Externer Berater: Sammer kehrt zum BVB zurück" (in German). Kicker. Retrieved 30 March 2018. ^ "Suresh Letchmanan to head Singapore office". Borussia Dortmund. Retrieved 20 August 2014. ^ "Chinese office - German soccer side increase their presence in Asia with a second outlet". SportsPro Media. Retrieved 5 December 2017. ^ "Patrick Owomoyela returns to the BVB family". Borussia Dortmund. Retrieved 6 March 2018. ^ "Riedle takes on international ambassador role for BVB". Borussia Dortmund. Retrieved 22 November 2014. ^ "Weidenfellers erste Reise als Markenbotschafter" (in German). Borussia Dortmund. Retrieved 16 July 2018. ^ "Norbert Dickel: Der Held am Mikro" (in German). Borussia Dortmund. Retrieved 2 September 2017. ^ "Die Geschichte des BVB – Teil 4: Die BVB-Historie von 1929 bis 1938" (in German). schwatzgelb.de. Retrieved 23 July 2013. ^ "Die BVB Trainer-Datenbank" (in German). schwatzgelb.de. Retrieved 23 July 2013. ^ "Dortmund at the Double: history in the making in 2012". Borussia Dortmund. Retrieved 27 January 2016. ^ a b "Borussia Dortmund". UEFA. 22 August 2012. Retrieved 18 March 2013. ^ a b "Real Madrid complete Nuri Sahin switch". realmadrid.com. Real Madrid C.F. 8 May 2011. Archived from the original on 14 May 2011. Retrieved 17 April 2013. ^ "Darf's ein Törchen mehr sein?". spiegel.de (in German). Spiegel. 28 April 2008. Retrieved 17 April 2013. ^ "Die Spielstatistik Borussia Dortmund – FC Bayern München" (in German). fussballdaten.de. Retrieved 24 April 2014. ^ "The First Ever Bundesliga Goal * Fastest ever Bundesliga goal scored by a substitute Miloš Jojić". theoffside.com. – Bundesliga blog. Archived from the original on 25 October 2012. Retrieved 17 April 2013. ^ "Pierre-Emerick Aubameyang jagt Uralt-Tor-Rekord von Klaus Allofs". Retrieved 8 August 2016. Wikimedia Commons has media related to Borussia Dortmund.